Situated in the high desert lands of Western Colorado, Grand Junction is dramatically different from most of the Rocky Mountain State. While it has all the outdoor activities that Colorado is known for (hiking, biking, rafting and skiing), the area’s two rivers — the Colorado River and Gunnison River – merge to create a fertile valley ideal for orchards and wineries. Grand Junction is the state’s largest western city, offering visitors a surprisingly wide range of activities and dining options for a unique Colorado family vacation. Looking for a Unique Colorado Family Vacation? My recent media visit to Grand Junction gave me a unique view of Colorado. In the past, I’ve visited Denver and skied at most of the fantastic mountain resorts. Western Colorado’s landscape is more similar to eastern Utah, with towering red rocks and canyons. On this trip, we hiked, skied, and indulged in tastings in the state’s only wine country (also home to some friendly alpacas). We discovered great restaurants on Main Street. Grand Junction, home to about 150,000 residents, has many family-friendly activities thanks to locals with a vision. These attractions are owned and operated by people who found ways to repurpose and grow their family business. In June, Grand Junction will unveil its first water features playground, Coconut Cove, at Bananas Fun Park. And beginning June 17, American Airlines will offer direct flights from Los Angeles to Grand Junction. It’s not every day you get to see a mountain resort through the eyes of ski patrol. Unless you’re at Powderhorn, which has a Ski Patrol Ski Along program that educates skiers about what these mountain patrol staff do. The program debuted this year for the resort’s 50th season. 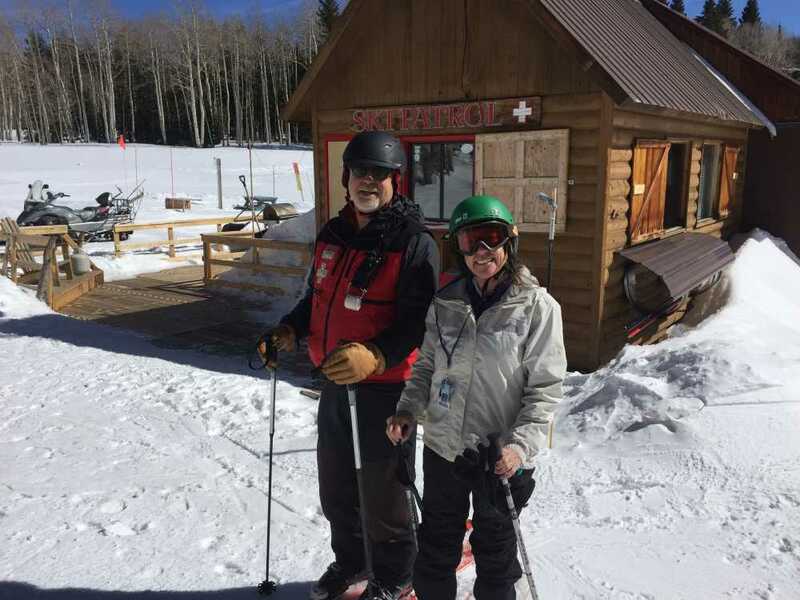 Though 80 percent of their job is resort maintenance, ski patrol also spends time training and providing medical assistance to injured skiers and snowboarders. During our tour, we made turns with Ski Patrol Director Rondo Buecheler and got an insider’s look at the mountaintop patrol facility. Two rooms are packed with an assortment of equipment including avalanche airbags, tools, and medical devices. “Every ski area has to have a plan to evacuate a chairlift in two hours,” explained Buecheler. In addition, the patrol has special teams who ride cables to assist people left dangling when their backpack gets stuck on a chairlift. The lesson here: wear your backpacks on your chest when riding a chairlift. As part of the Ski Patrol Ski Along you can ride down the mountain in a toboggan pulled by ski patrol. Just like people who get injured on the mountain. Except you do it for fun! Ski Patrol Ski Along rates (per person): $75/two hours, $95/four hours. To book, call 970-268-5158. Independence Rock stands proudly alone in Colorado National Monument. Photo Credit: Barbara Bowman, Grand Junction CVB Division Manager. In the early 1900s, naturalist John Otto carved trails and lived in the rugged canyon country southwest of Grand Junction. It was designated a national monument in 1911. The park attracts visitors to its canyons, arched windows, rock spires and natural monoliths. Allow about two hours to visit the park, home to elk, mountain lions, yellow collared lizards and bighorn sheep. 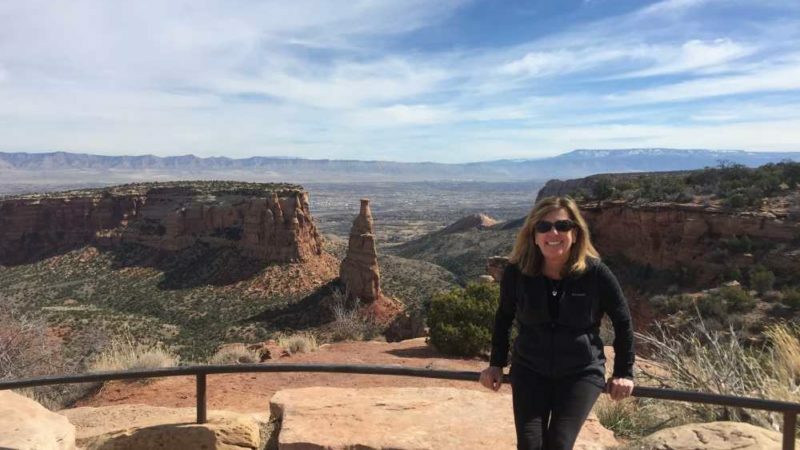 “It’s an uncrowded, intimate park experience,” says Barbara Bowman, Grand Junction CVB Division Manager. Though the park has about 18 trails, you don’t have to be a great hiker to explore the colorful canyons. We took a leisurely walk along the level, half-mile Canyon Rim Trail. The easy trail follows the cliff edge above Wedding Canyon, providing amazing views of the red rocks and the distant Book Cliffs. The trail starts at the Visitor Center and at the Book Cliffs Overlook, where we started out. If you prefer a windshield view of the park, you can still get good photos at one of the many lookout points with parking. Traveling Mom Tip: Enter the park from the west side and travel east so you end up in downtown Grand Junction for a bite to eat. 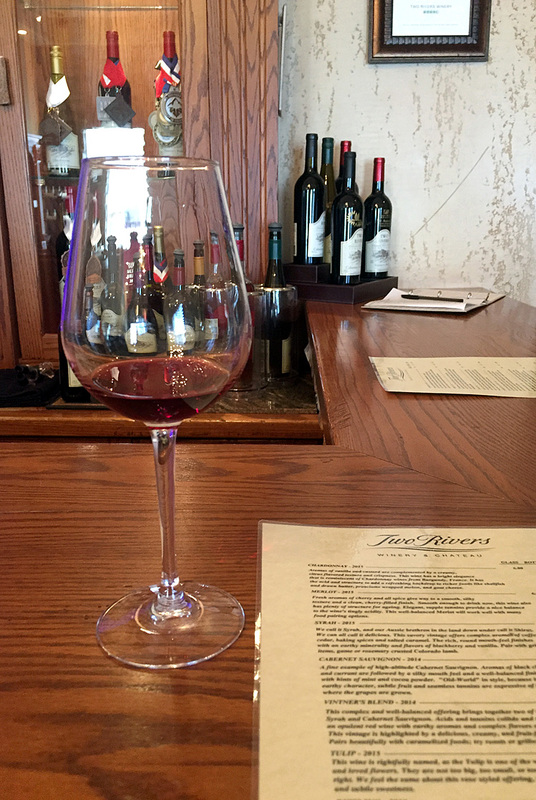 Located in the Redlands area of Grand Junction, Two Rivers Winery & Chateau is a casual yet elegant place to sip local wine. Though not located in Colorado’s wine country, it has an excellent location between the gateways of the Colorado National Monument. We just went for the tastings, but the B&B has 10 rooms for those who choose to stay. On our mid-week, noontime visit, we were the first ones there ready to partake in the eight free tastings. Special Projects Manager Robert Cromwell, whose in-laws own the place, described each wine produced in the onsite winery. The premium wines they currently produce are Chardonnay, Merlot, Cabernet Sauvignon, Riesling, Syrah and Port. We started the tastings with a 2015 refreshing Chardonnay and wrapped up with a 2013 port. I usually find ports too sweet, but enjoyed this one with a bite of chocolate. About a 20-minute drive from Downtown Grand Junction are orchards, farms and wineries. 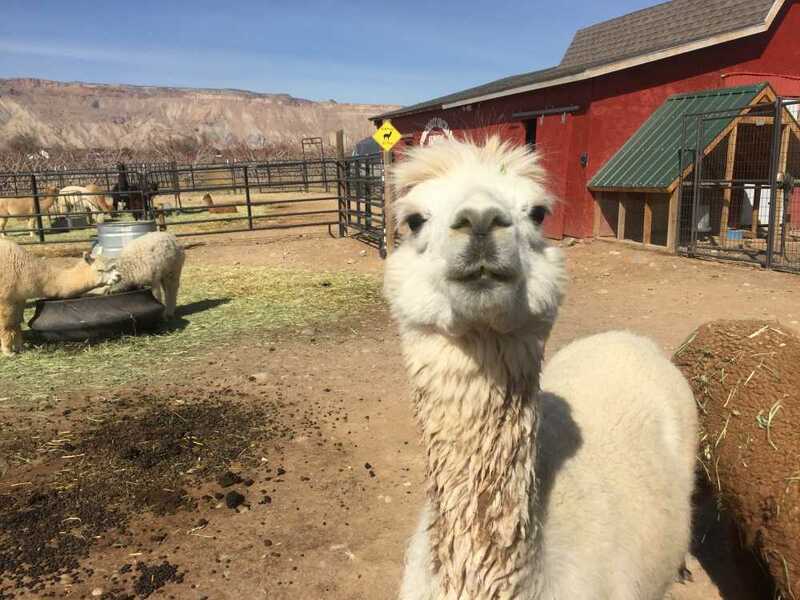 Nestled in the heart of this region is the SunCrest Orchard Alpacas Farm, housing about 35 of these cute furry critters, which resemble small llamas. “They’re very social, but they keep their distance,” says Mike McDermott, who grew up on the farm (he built the barn when he was 15 years-old). McDermott purchased the farm from his mom (who still lives on the property), and today runs the place with his wife, Cindy. The alpacas were introduced here in 2005. Visitors are welcome to tour the farm and learn about processing fiber into yarn. After admiring the docile alpacas, we toured the “sweat shop” where fiber processing takes place. McDermott explained that humidity helps control static in the shop where fiber is washed, dried, separated, plied, steamed and bagged. Finished products are distributed internationally, and also sold in the small farm store. Art on the Corner features 100-plus sculptures on Main Street. Photo Credit: Mimi Slawoff, Los Angeles TravelingMom. 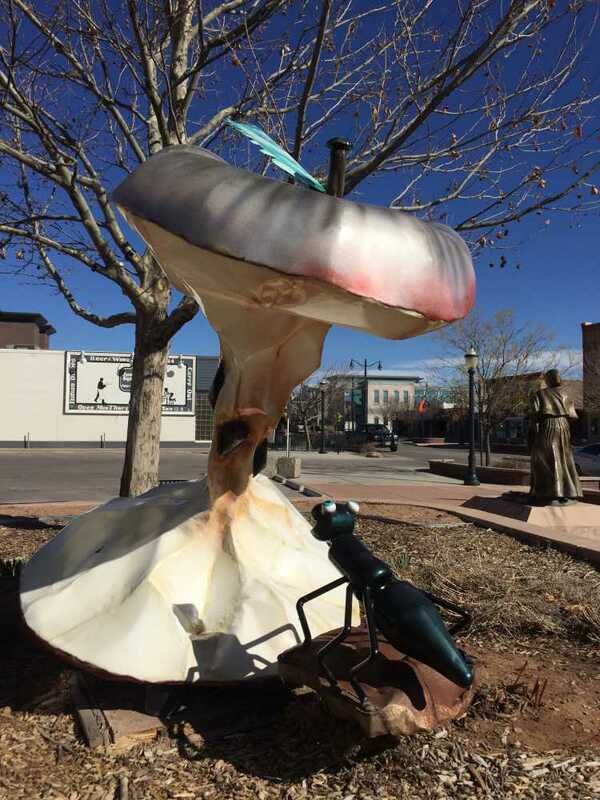 For a somewhat sleepy Colorado town, Grand Junction has several good restaurants, mom and pop shops, and unique public art on sidewalks and corners. Along Main Street are numerous boutiques, such as Pollux Clothing, where I bought some cute purple stone earrings for $15. Alida’s Fruits sells a range of Colorado souvenirs and has a big selection of chocolates, jams, and preserves from local farms. The peach preserves are amazing. Even if you’re not shopping, you can enjoy the 100-plus art sculptures on sidewalks and corners. We ate at several downtown restaurants worth writing home about, including the kid-friendly Rockslide Restaurant & Brewery, and trendy Bin 707 Foodbar. The Dream Cafe serves a great breakfast. I especially enjoyed my lunch at il Bistro Italiano. 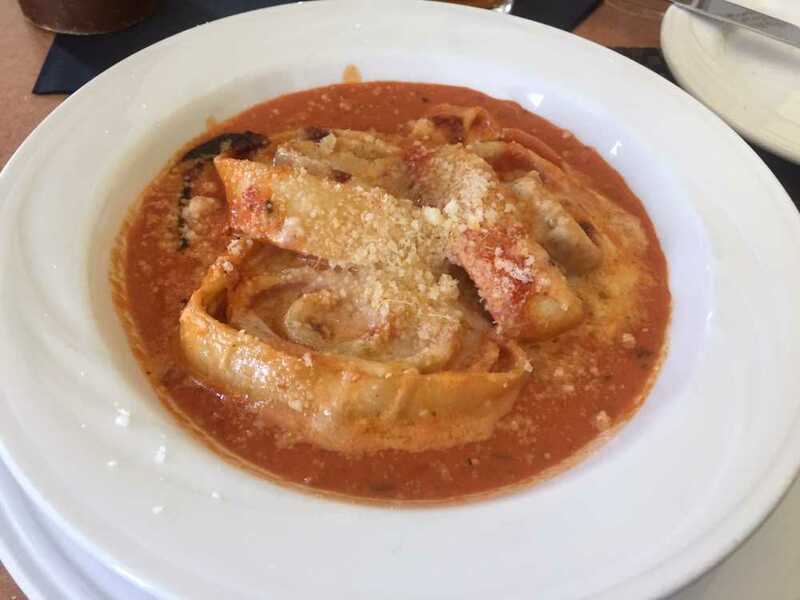 The signature dish, Rosetta, is a house made pasta rolled with rosemary ham and provolone cheese, sliced baked and served with spicy tomato cream sauce. Located in the heart of downtown, the Fairfield Inn & Suites by Marriott is family-friendly. Photo Credit: Mimi Slawoff, Los Angeles TravelingMom. 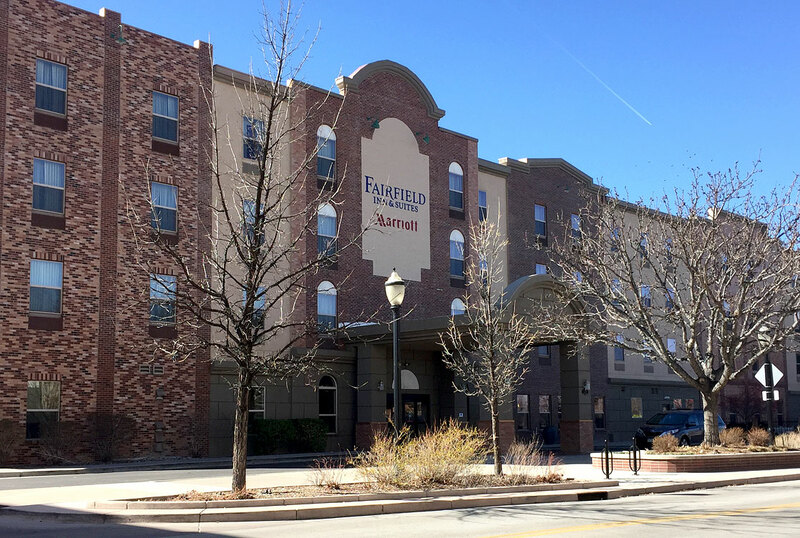 There’s nothing fancy about the Fairfield but it’s got a great downtown location, clean and spacious rooms, and a friendly staff. I liked that family-friendly hotel amenities were within easy reach. There’s a compact but efficient exercise room overlooking the indoor swimming pool. My floor had guest laundry facilities. The free breakfast has a good selection of hot and cold items. Restaurants and shops are right outside the front doors. 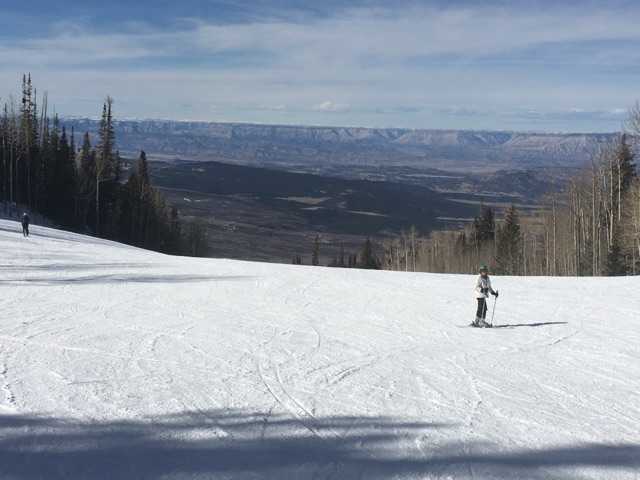 Looking for a family-friendly ski resort closer to Denver? Consider Copper Mountain. 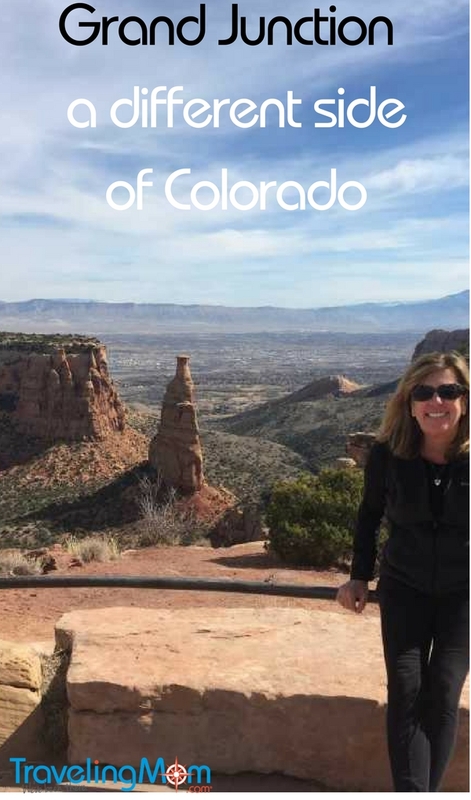 Colorado also has ideal getaways for couples.